"The Chalet Hotel Sapinière has an unbeatable location by the Savoy teleski gondola takes you up to the Brevent ski area, the only lift from the town of Chamonix itself. Enjoy stunning views of Mt Blanc and the other towering peaks above 4000m. There are good links to other ski areas in Chamonix through the resort bus service. The Sapinière is a great choice for families, with nursery slopes over the road from the hotel. 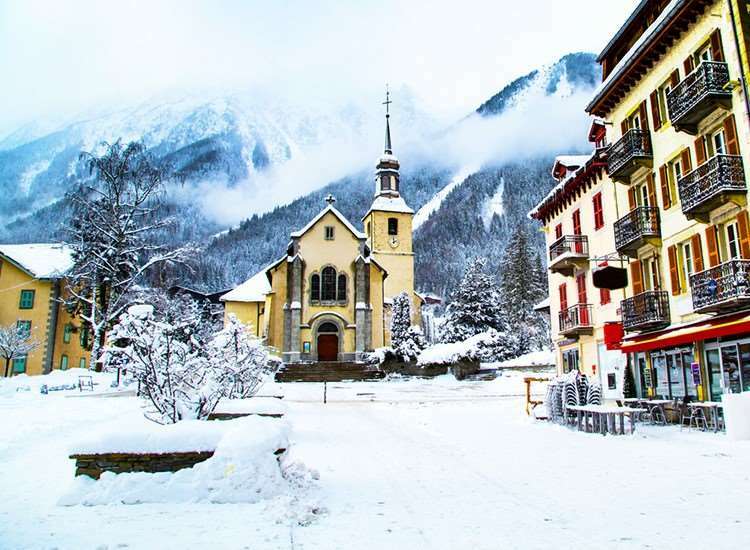 Chamonix also benefits from a short transfer time of just an hour and a quarter from Geneva airport. " Alternatively, the ski-bus to Chamonix's other ski areas stops just 50m away. The hotel's attractive dining room has semi-circular bay windows with stunning views of Mont Blanc. Here you will enjoy our great choice of menus and complimentary quality wines for dinner. We offer the conviviality of larger tables for chalet-style dining with your fellow guests, or the opportunity to dine à deux should you wish. The atmospheric lounge/bar welcomes you for your pre-dinner apéritif and canapés, or to relax after dinner over coffee and a night-cap, whilst the huge sun terrace offers the same stunning Mont Blanc views as the dining room, and makes an ideal spot to round off your ski day with a well earned drink! The resort centre is just 4 minutes' walk with an excellent choice of bars and restaurants. Room 35 - Twin with bath/wc/balcony. Room 1 - Double with bath/wc/balcony. Glass of prosecco served before 3 course buffet style with a choice menu and complimentary wine & tea/coffee on 6 nights. Vegetarian options are always available to choose from our menus, and other special diets can be catered for at a supplement, if booked with us in advance. Chalet Hosts will discuss your dietary requirements with you upon arrival to the Chalet Hotel. This is one of the best hotels I have stayed in for skiing. Great location with wonderful views. The dining room has a panoramic view of Mont Blanc. The food was buffet style, with choices, all beautifully cooked. The staff were all absolutely lovely and the hotel was clean and comfortable. We have had an excellent stay at This Hotel Staff are very helpful and friendly the views were spectacular from our room. We loved the food we would definitely go back.